Ford wouldn’t be happy with you knowing this, but there’s a secret behind the enormous sales figures put up in America’s ongoing pickup war: that the F-150 hasn’t always been the best-selling truck. 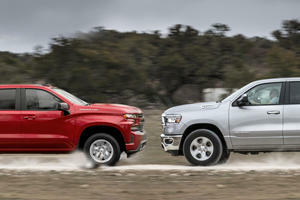 If you combine sales of the Chevy Silverado and GMC Sierra, two trucks that share almost everything but a badge, they put General Motors ahead of the F-Series throughout some of the 40 years Ford has claimed to be number one. But regardless of who has the top spot, there’s no arguing that both automakers are raking cash into their coffers as truck sales continue to grow and as buyers shell out more money for premium trims. It’s that latter trend that gives GM the advantage here, since the strategy of selling its truck under two different marquees means it already has a premium brand to hawk at buyers while Ford and Ram scramble to differentiate high-end F-150s and 1500s from cheaper versions. We’ve choked down quite a few test trucks from each of America’s three truck makers, but we couldn’t pass up the chance to drive a 2019 Sierra for a week when GMC offered one to us, especially when it was a range-topping Denali equipped with the largest and most powerful of General Motor’s pickup engines. Booking the Denali in an age where the world’s appetite for luxury SUVs has spilled over into the US truck market brought two questions to out minds. First, how much more upscale is the Sierra than the Silverado? And second, how does it compare with Ford and Ram’s most luxurious trucks? Even if they’re the same vehicle at their cores, the Sierra and Silverado couldn’t be more different from one another stylistically. Chevy went ahead and gave this generation’s Silverado a grille that’s bold at best and ugly at worst, but the Sierra’s top trim gets a more "conservative” front end featuring a chrome grille that could double as a Texan’s belt buckle. It’s then complimented by liberal helpings of chrome trim on everything from the front tow hooks and the borders of the daytime running lights to the side mirrors and power running boards. 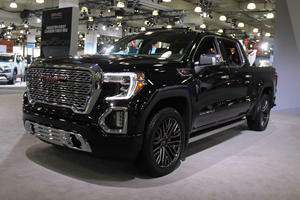 The wheels, trim around the side windows, and dual exhaust outlets underneath the rear bumper aren’t spared from the onslaught of shiny stuff either, but our Denali avoided seeking too much attention by contrasting its glitter with a handsome shade of Onyx Black. When parked next to the F-150 Limited or a Ram 1500 Limited, the Denali stands out. And it’s not just because the name "Denali” is more original than "Limited.” Rather, it’s because of how the Sierra looks like a proper luxury truck complete with a distinct body instead of resembling a blinged-out version of the Silverado’s. If outward looks are the guiding force behind your luxury purchase, then the choice is clear. Interior Design & Features: Where'd My Money Go? It’s unfortunate, then, that the perception of the Sierra Denali as a lavish work machine falls apart inside the cabin. Our tester was equipped with a jet black color scheme, muting the cozy feeling that a shade of brown leather could have instilled in occupants, but GM’s ultimate sin is that it modeled the interior of its current pickup family after the last generation’s. Blame the familiar layout on market research that found customers liked the old interior, but GM’s eagerness to stick with known territory rather than try a new design that preserves the better aspects of the old truck makes the current Silverado and Sierra feel dated. 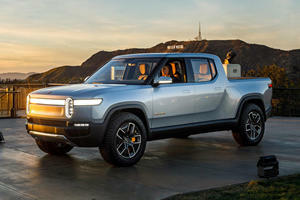 While Ford and Ram experiment with panoramic sunroofs, two-tone leather interiors, wood and soft-touch leather surfaces, and large vertical Tesla-like infotainment systems, the GMC gets plastic chrome trim and bits of real wood stuck on like afterthoughts to differentiate it from the Silverado. Even with a heated steering wheel, heated front and rear seats, cooled front seats, a head-up display, plenty of power outlets to charge USB, USB-C, 12-volt, and 120-volt devices with, and a wireless phone charger, the Sierra Denali lacks the interior eye candy that makes its competition stand out. On the upside, the interior of the Sierra does feel quieter and more insulated than the Silverado’s, and unlike GM’s last generation of trucks, the new Sierra has a roomy interior with ample amounts of storage capacity. Another thing our Sierra Denali had plenty of was displacement. Though it’s available with a turbocharged 2.7-liter four-cylinder engine, a 4.3-liter V6, two 5.3-liter V8s (one with GM’s Dynamic Fuel Management tech), and soon a 3.0-liter diesel V6, our tester got the range-topping 6.2-liter V8 that makes 420 horsepower and 460 lb-ft of torque. It comes mated to a 10-speed automatic transmission and sends power to the rear wheels unless the four-wheel drive system is engaged. We’ve had experience with this drivetrain in a Silverado LTZ, but it exhibited a different character than the Sierra. Rather than attack the pavement angrily as if it’s trying to get get revenge on an F-150 Raptor, this pushrod V8 felt programed to be calmer and better suited for towing rather than hooliganry. While the transmission shifted smoothly, it stumbled around in search of the right gear at times; a problem considering how smoothly the 10-speed in the F-150 feels. For the past few generations, GM has played around with different iterations of its cylinder deactivation system. This Sierra Denali gets the latest version of it, making the truck capable of 15 mpg in the city, 20 on the highway, and 17 mpg combined given that the Dynamic Fuel Management system lets the engine switch between 17 different firing patterns in order to use its eight cylinders less than 40% of the time. 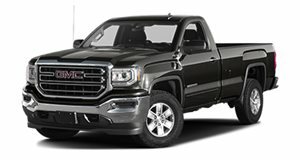 Even with a strong emphasis on fuel economy, a double cab version of the 2019 Sierra can tow up to 12,200 pounds when optioned with the 6.2-liter V8 and the Max Trailering Package. The new truck also cuts a large hole in the atmosphere for the trailer behind it thanks to its dimensions, which include a width of 81.24 inches and height of 75.49 inches. The side profile is no less intimidating, with our crew-cab Denali spanning 231.72 inches and swallowing up a 147.43-inch wheelbase. The bed itself can hold 71.7 cubic-feet of whatever you’d like, but more fun than the numbers is the way you access that space. Our Denali got GMC’s split-folding tailgate, which basically embeds a second tailgate within the larger outer tailgate that can double as a workbench, a slot to hold long objects in place so you can close the outer tailgate, or as a step to make it easy to climb into the bed. It’s features like those that show how each manufacturer goes the extra mile in order to win customers. More horsepower, more towing capacity, more ways to open the tailgate, all of these additions count. But so does the way each truck makes its driver feel. The Ram is all about instilling unbelievable amounts of confidence in its drivers through masterful design of its chassis, suspension, and steering. It makes the Ram a fantastic city driver, but the F-150 is the one you buy for the classic body-on-frame feel you expect from a truck, albeit with implausible amounts of agility and near-perfect powertrain tuning. Both of these trucks deliver such confidence and comfort that they made us spend our week with the Sierra Denali wondering just what the heck happened to General Motors during this round. It’s not that GM has dropped the ball entirely, it’s just that neither the Silverado or Sierra feels as refined as the competition. Especially in the luxury realm that the Denali plays in. Driving on Arizona roads during a rare desert snowstorm uncovered steering that isn’t as direct as it could be, and keeping the Sierra straight on the highway is a task that consumes more mental energy than a luxury truck should demand. The Sierra neither hunkers down to take corners with agility like a Ram nor does it soak up bends as if G-force doesn’t affect its chassis like an F-150. It just exhibits roll like you’d expect a truck to and calls for care in the turn lane. The Sierra’s brakes don’t inspire nearly as much faith as the Ford’s hard-biting pads do either, adding to the need for a driver to devote most of their energy to driving. Not all is lost though. Compared to the Z71 Silverado we drove, the Sierra feels calmer and more composed even though larger cracks in the road do send bumps resonating throughout the chassis. The engine’s Dynamic Fuel Management system operates smoothly without hinting at how many cylinders are actually being used at any given time. And while the Sierra’s suite of driver aids didn’t include automatic cruise control, it did have lane-keep assist, blind spot monitoring, and an 8-inch infotainment display with Apple CarPlay and Android Auto to help make time behind the wheel go by quickly. But what really hurts the Sierra Denali in this category is its price, $67,340 including destination and a discount. That’s well into luxury car territory but in line with a well-spec’d Ram 1500 Limited and cheaper than a fully-loaded F-150 Limited. Part of what inflated our Denali’s price tag was the $2,495 6.2-liter V8 and the $5,850 Denali Ultimate package, which adds a sunroof, 22-inch polished aluminum wheels, HD surround view cameras, and driver aids such as forward collision alert, lane keep assist with lane departure warning, low speed forward automatic braking, and power running boards. Forgoing these options makes it possible to snag a Sierra Denali for $59,495 including destination, but the cheapest way to get the 6.2-liter V8 is by opting for the $53,390 Sierra SLT. If neither are important to you, then you can always start out with a base 2WD Sierra with a 4.3-liter V6 for $36,590 and work up from there. For the way GMC packaged the Sierra’s exterior and the prestige the Denali name brings with it, that price may be worth it to some. But we suspect it won’t be many. That has a lot to do with how the Denali answered our two questions. While it is more upscale than the Silverado, the benefit goes mainly to those looking at its body. Occupants inside will like the quieter ride, but the lack of bling makes the Sierra Denali feel more like a GM rebadging job (though not quite the Cadillac Cimarron) than a step up from the Silverado. And that’s a problem when it comes time to answer question number two: how it stacks up against the Ram 1500 Limited and F-150 Limited. While both of those trucks may lack the exterior differentiation, the Ram and F-150 are quieter, smoother, and feel more special to drive. Like the Silverado, the Sierra Denali owes its rough edges to the fact GM used a similar recipe as last time for the latest generation of its full-size truck. Or at least that’s how it feels. There are plenty of buyers who’ll like that, but we’re guessing they aren’t the type to want to shell out a premium for a luxury pickup truck.